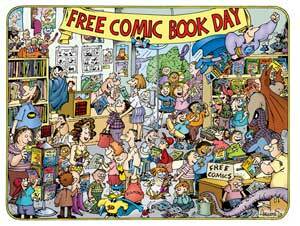 » Free Comic Book Day – Saturday, May 1 – support your local shop! Free Comic Book Day – Saturday, May 1 – support your local shop! This Saturday is Free Comic Book Day. It is a day when you can walk into participating comic book stores and pick up a comic or two relating to stories/titles you know or take a chance on a publisher or title that you don’t know about. Expand your horizons and check out something dangerous. Something you wouldn’t otherwise read. And just because it’s called “Free Comic Book Day” doesn’t mean that all comics are free. Last year, the first store that I went to had a buy one, get one free TPB sale. What a deal! So, go out, grab a free comic or two and bring your kids. And, by all means, support your local comic book shop and buy some comics, t-shirts, trades, busts, etc., and let them know that you’ll be back throughout the year and not just one day out of 365. They’ll appreciate it. Which upcoming film are you most excited about? All other images and characters are the property of their respective rights holders. No infringement is intended.